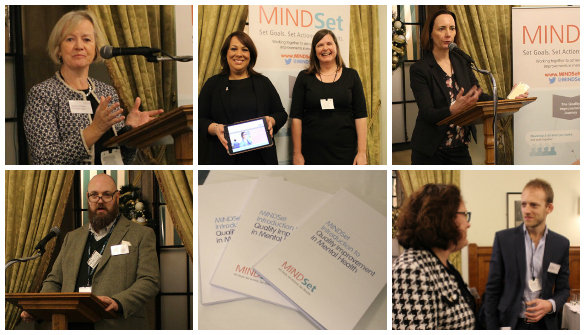 A new online toolkit for people involved in providing and commissioning services for people with mental health problems was officially launched last week at a special event at the Houses of Parliament. The MINDSet quality improvement toolkit is funded by the West of England AHSN and NHS Improvement and has been designed with the involvement of a range of partners, with the aim of making continuous improvement in mental health easier. The toolkit provides a range of improvement tools and handy summaries of national policy and guidance. There are also case studies demonstrating how different mental health services have used the tools, sharing their results and learning. 55 colleagues from our regional member organisations and healthcare organisations across the country attended the event, which was hosted by MPs Paula Sherriff and Jason McCartney, and it was great to be able to share the work with Helen Whately MP, who sits on the Health Select Committee. Dr Geraldine Strathdee, National Clinical Director for Mental Health, presented an overview of ‘A year of improvement in mental health’, while Clare Lyons-Collins, Head of Mental Health Policy at NHS Improvement, talked through highlight developments in quality improvement in mental health. If you would like to find out more about the toolkit, visit www.mindsetqi.net.